As the frequency band for wireless communication shifts higher and higher, the generation of power efficient, low phase noise, broadband and configurable compact signal sources (oscillators) with low cost has become more and more challenging, due to the frequency limitations of the devices (transistors). The performance of communication systems depends on the speed of the devices used, and is typically specified by two figures-of-merit (FOM). The first FOM is the transistor cut-off frequency fT; the second FOM is the maximum oscillation frequency fmax (defined as the frequency at which the current gain and the power gain become unity, respectively). 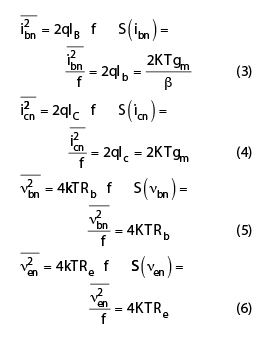 To meet this challenge, the transistor geometric profile needs to be scaled for higher fT and fmax. Technology scaling has driven this momentum to a high level of integration.1 Device scaling has been the critical driving force behind high speed integrated RF (radio frequency) and MW (microwave) solutions. Since the operating frequency of the oscillator is limited by the fT of the transistors, RF and MW integrated circuits are often designed using GaAs HBTs, which offer high fT, but typically exhibit higher flicker corner frequency (fc) and are power hungry, and are therefore not suitable for low phase noise and power efficiency in signal generation applications.1–19 Si BJTs typically have a low flicker corner frequency, but do not have sufficient gain to sustain stable oscillation at RF and microwave frequencies because of their limited fT and fmax.14 SiGe HBTs offer lower fc and comparable fT to GaAs HBTs, making them the favorable choice for low phase noise and power-efficient RF and MW signal generation applications.13,14 The oscillator phase noise performance is one of the areas where SiGe HBT devices outperform III-V devices.16,17 SiGe HBT has progressed over the last decade from a digitally oriented technology to one well suited for RF and microwave applications (due to its superior analog and RF performance and its CMOS integration capability).13–19 Hence, SiGe HBT technology is a promising contender among Si-based technology, due to its advantages over CMOS technology such as higher fT, lower noise and power-efficient performance. 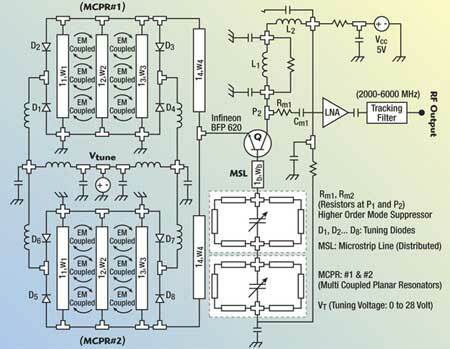 This article discusses the impact of scaling on phase noise and the minimization of phase noise in SiGe HBTs coupled voltage-­controlled oscillators (VCO). Fig. 1 CE equivalent circuit noise model of the SiGe HBT transistor. All are technological scaling sensitive device parameters and can be optimized for higher fT and minimum noise figure for high frequency low noise oscillator applications. 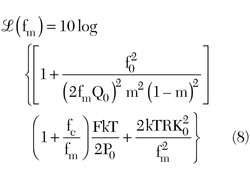 From Equation 10, Fmin at low frequency can be minimized by increasing the value of the current gain β and reducing the values of RB at a given device bias (IC = IDC1) condition. However, Fmin at low frequencies can be improved by increasing β, but is limited by the negative impact on the breakdown voltage BVCEO. 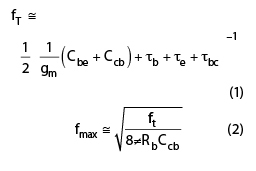 From Equation 11, at high frequencies, Fmin can be minimized by decreasing the value of RB and increasing fT at a given device bias (IC = IDC2). In SiGe HBTs, the parasitic emitter base junction capacitance Cbe and the parasitic base resistance Rb vary linearly with emitter width we, allowing Fmin at low and high frequency regions to continue scaling down linearly with we. 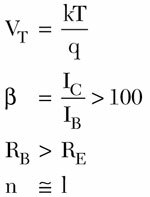 The parasitic emitter base junction capacitance Cbe and the parasitic base resistance Rb decrease proportionally to the emitter strip length Le, whereas Cbe and Rb increase proportionally to the emitter width we. The noise factor F is a technological scaling sensitive parameter and can be optimized with respect to the transistor geometric profile of the scaled SiGe HBTs to obtain the minimum noise figure for low phase noise oscillator applications. Fig. 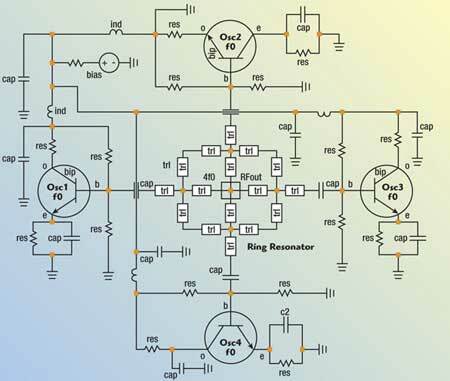 2 Schematic of the 2 to 6 GHz coupled resonator VCO (patent pending). 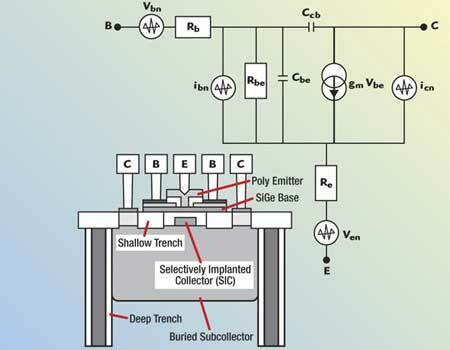 For high frequency applications, vertical scaling is done by reducing the base and collector transit times of the SiGe HBT technology, which requires a narrow and heavily doped base profile, with a higher Ge mole fraction. Therefore, it results in a lower thermal budget, and an increase in 1/f noise.1 Figures 2 and 3 illustrate the schematic and layout of the multi-coupled resonator-based VCO for a 2 to 6 GHz frequency band (patent pending). Figure 4 shows the measured phase noise for scaling factors 1:1 and 1:2. As depicted, the device scaling increases the contribution from 1/f noise (near the carrier), whereas it decreases the contribution from base current shot noise and base resistance thermal noise (far from the carrier). Fig. 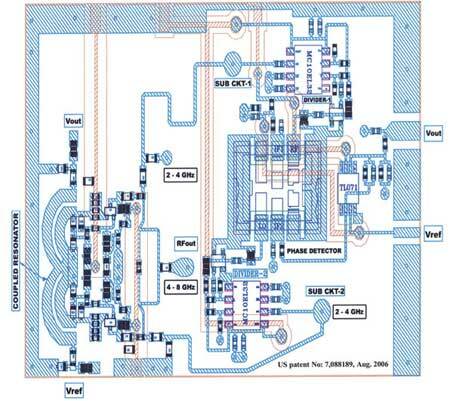 3 Layout of the 2 to 6 GHz coupled resonator VCO (patent pending). As shown, the degradation at 1 kHz offset from the carrier frequency is 3 to 6 dB, whereas the improvement at a 1 MHz offset frequency is 6 to 12 dB. Fig. 4 Measured phase noise plot of a 2 to 6 GHz VCO for scaling 1:1 and 1:2. The coupled oscillator N-Push approach improves the phase noise performance by a factor of N (N is the number of the oscillators sub-circuits), and extends the operating frequency beyond the limitation caused by the cut-off frequency of available active devices. Fig. 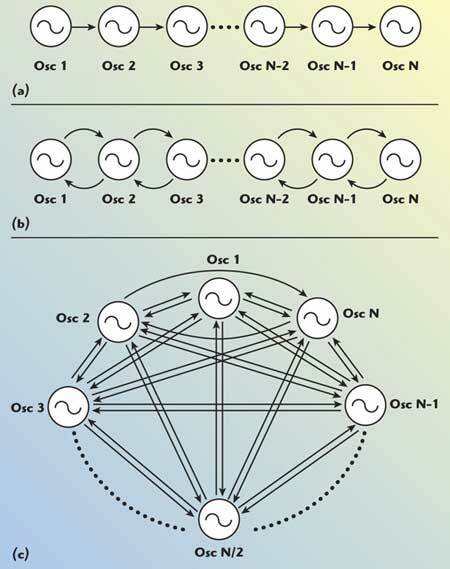 5 Systems of N-push oscillators: (a) nearest neighbor unilateral coupling; (b) nearest neighbor bilateral coupling; and (c) global coupling. Fig. 6 N-coupled mode oscillators. Fig. 7 Schematic of an N-push (N=4) coupled oscillator. 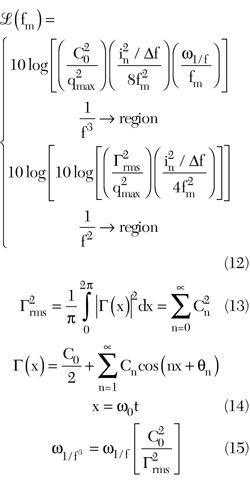 From Equation 15, the 1/f noise up-conversion is closely related to the symmetry property of the oscillator signal waveforms, and the 1/f noise up-conversion can be reduced by minimizing the value of C0 and by optimizing the slope and symmetry of the rise and fall time of the oscillator output waveform. Fig. 8 Simulated RF output current waveforms of the 4-push VCO; (a) asymmetrical and (b) symmetrical. 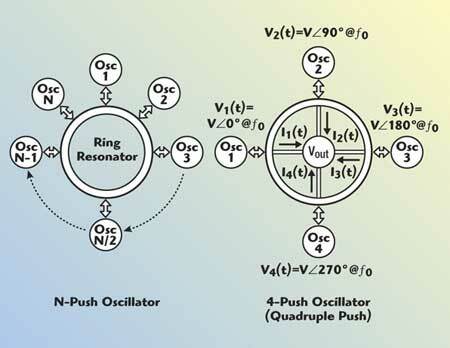 Figure 6 shows typical simplified N-coupled oscillators, coupled through a common resonator and an example of a 4-Push oscillator. Figure 7 shows the schematic of the 4-Push coupled oscillators operating at a fixed frequency of 8 GHz (4f0). Figure 8 depicts the simulated plot of the symmetrical and asymmetrical output waveforms for the N-Push (N = 4) VCO, using scaled SiGe HBTs (Infineon BFP620, scaling 1:2). For better insight about the coupled mode N-Push domain, it is necessary to know how the noise is affected by the scaling and symmetry of the waveforms. From Equations 15 and 16, the noise performance and 1/f noise up-conversion can be optimized by improving the symmetry of the waveform in N-Push topology for a given size of the device. 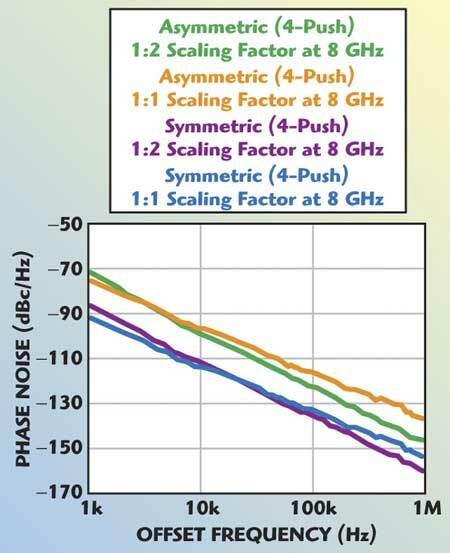 Figure 9 shows the improvement in phase noise performance for a scaled coupled mode 4-Push VCO. 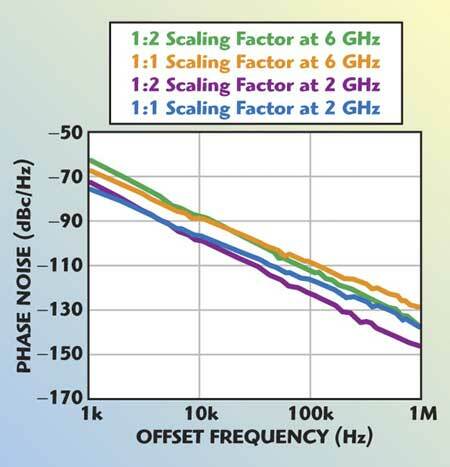 At 1 kHz offset, it is of the order of 6 to 10 dB, whereas at 1 MHz offset the improvement is of the order of 8 to 15 dB for a device area scaling factor of 1:2. Figures 10 and 11 show the block diagram and layout of the scaled device coupled mode multi-octave band 2-Push VCO (2 to 8 GHz). Fig. 9 Measured phase noise of the coupled 4-push VCO. The typical measured phase noise is better than –90 dBc/Hz at a 10 kHz offset from the carrier.3 Competing other alternative semiconductor technologies may not deliver the same level performance in terms of cost, size, power, linearity, tunability, adaptability, reconfigurability and integrability for this class of VCOs using scaled devices. Fig. 10 Block diagram of a coupled mode 2-push, 2 to 8 GHz VCO (patented). Fig. 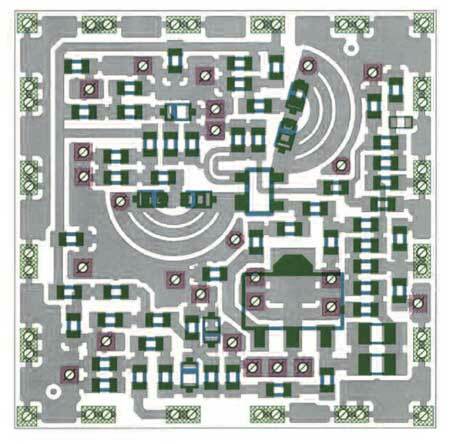 11 Layout of a coupled mode 2-push, 2 to 8 GHz VCO (patented). 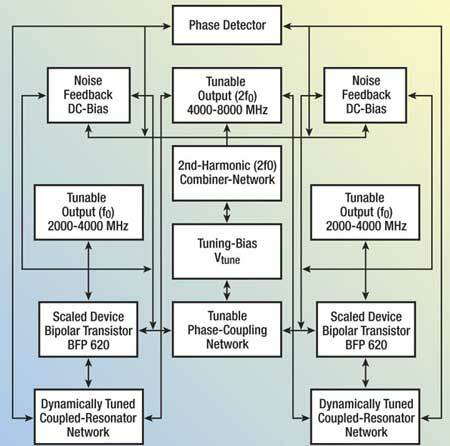 The multi-octave band design approach based on device scaling and optimum symmetry of the signal waveforms demonstrated in this work enables wide tuning, extended frequency of operation and lower phase noise performance, which are attractive for present industry applications. This article describes the impact of device scaling on phase noise in coupled oscillators, which have recently emerged as strong contenders for radio frequency (RF) and mixed-signal applications. G. Niu, J. Tang, Z. Feng, J. Alvin and L. David, “Scaling and Technological Limitations of 1/f Noise and Oscillator Phase Noise in SiGe HBTs,” IEEE Transactions on Microwave Theory and Techniques, Vol. 53, No. 2, February 2005, pp. 506–514. U.L. Rohde, A.K. Poddar, J. Schoepf, R. Rebel and P. Patel, “Low Noise Low Cost Ultra Wideband N-Push VCO,” 2005 IEEE MTT-S International Microwave Symposium Digest. H. Xiao, T. Tanaka and M. Aikawa, “A Low Phase Noise Ku-band Push-push Oscillator Using Slot Ring Resonator,” 2004 IEEE MTT-S International Microwave Symposium Digest, Vol. 3, pp. 1333–1336. A.K. Poddar, “A Novel Approach for Designing Integrated Ultra Low Noise Microwave Wideband Voltage-controlled Oscillators,” Dr.-Ing. Dissertation, TU-Berlin, Germany, 14 December 2004. A. Hajimiri and T.H. Lee, “A General Theory of Phase Noise in Electrical Oscillators,” IEEE Journal of Solid-State Circuits, Vol. 33, No. 2, February 1998, pp. 179–184. H.C. Chang, X. Cao, M.J. Vaughan, U. Mishra and R. York, “Phase Noise in Coupled Oscillators: Theory and Experiment,” IEEE Transactions on Microwave Theory and Techniques, Vol. 45, No. 5, May 1997, pp. 604–615. U.L. Rohde and A.K. Poddar, “MEMS Enabled VCO for Wireless Connectivity,” GigaHertz2005, Sweden, November 8–9, 2005. S. Romisch, J. Kitching, E.S. Ferre-Pikal, L. Hollberg and F.L. Walls, “Performance Evaluation of an Optoelectronic Oscillator,” IEEE Transactions on Ultrasonics and Ferroelectrics, Vol. 47, No. 9, September 2000, pp. 1159–1165. A.K. Poddar, J.K. Bansal and K.N. 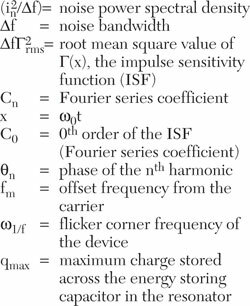 Pandey, “Millimeter-wave Evanescent Mode Power Combiner Gunn Oscillator in Suspended Stripline Configuration,” Mathematical Methods in Electromagnetic Theory, IEEE/MMET, June 1998, pp. 384–386. 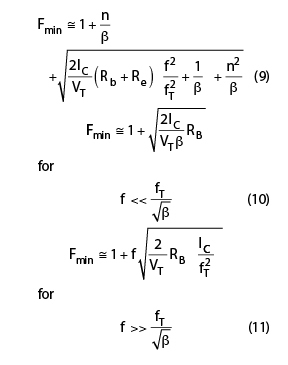 R. Leier, “SiGe Silences YIG Oscillator Phase Noise,” Microwave & RF, January 2006, pp. 79–82. U.L. Rohde and A.K. Poddar, “Impact of Device Scaling on Oscillator/VCO Phase Noise in SiGe HBTs,” International ­Semiconductor Device Research Symposium, ISDRS 2005, December 7–9, 2005. D. Harame, et al., “Current Status and Future Trends of SiGe BiCMOS Technology,” IEEE Transactions on Electron Devices, Vol. 48, No. 11, November 2001, pp. 2575–2594. J.D. Cressler and G. Niu, Silicon-Germanium Heterojunction Bipolar Transistors, Artech House Inc., Norwood, MA, 2003. G. Niu, J.D. Cressler, S. Zhang, W.E. Ansley, C.S. Webster and D.L. Harame, “A Unified Approach to RF and Microwave Noise Parameter Modeling in Bipolar Transistors,” IEEE Transactions on Electron Devices, Vol. 48, No. 11, November 2001, pp. 2568–2574. L. Vempati, et al., “Low Frequency Noise in UHF/CVD Epitaxial Si and SiGe Bipolar Transistors, IEEE Journal of Solid-State Circuits, Vol. 31, No. 10, October 1996, pp. 1458–1467. A.K. Poddar and K.N. Pandey, “Evanescent Mode Power Combiner in SSL Configuration,” High Performance Electron Devices for Microwave and Optoelectronic Application, 8th IEEE International Symposium Digest, November 2000, pp. 196–201. A.P.S. (Paul) Khanna, “Microwave Oscillators: The State of The Technology,” Microwave Journal, Vol. 49, No. 4, April 2006, pp. 22–42. 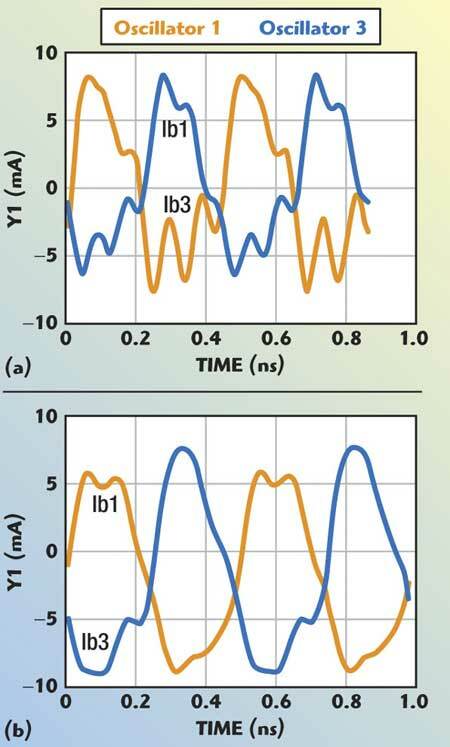 S. Romisch and R. Lutwak, “Low Power, 4.6 GHz, Stable Oscillator for CSAC,” IEEE IFCS Digest, June 4–7, 2006, pp. 448–451. A.K. Poddar, S.K. Koul and B. Bhat, “Millimeter-wave Evanescent Mode Gunn Diode Oscillator in Suspended Stripline Configuration,” IR &MM Wave, 22nd International Conference Digest, July 1997, pp. 265–266. S. Sun and L. Zhu, “Guided-wave Characteristics of Periodically Nonuniform Coupled Microstrip Lines—Even and Odd Modes,” IEEE Transactions on Microwave Theory and Techniques, Vol. 53, No. 4, April 2005, pp. 1221–1227. Ulrich L. Rohde studied electrical engineering and radio communications at the Universities of Munich and Darmstadt, Germany. He holds his PhD degree in electrical engineering (1978) and his Sc.D. (hon. 1979) in radio communications, his Dr.-Ing. (2004) and several honorary degrees. He is president of Communications Consulting Corp.; chairman of Synergy Microwave Corp., Paterson, NJ; and a partner of Rohde & Schwarz, Munich, Germany. He was previously president of Compact Software Inc., Paterson, NJ, and business area director for radio systems of RCA, Government Division, Camden, NJ. He is a professor of microwave circuit design and has held visiting professorships at several universities in the United States and Europe.